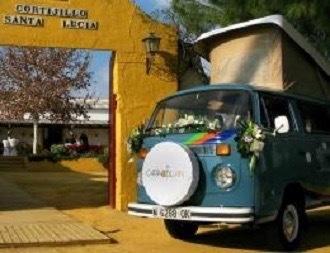 Welcome to Caracolvan VW Camper Hire, Spain. CaracolVan - based in El Puerto de Santa Maria, Cadiz, Andalusia, Spain. Have you ever felt the freedom of staying and sleeping in the same place as where you just enjoyed a beautiful sunset? or, how about the feeling of getting out of your bed and listening to the waves? Then it is time to think it may be possible. Hiring a Caracolvan camper offers you the opportunity of enjoying all of the above. Are you a lover of open spaces and nature? During the day the passenger seat can be swivelled around to create a relaxing lounge/dining area and then at night, the back bench seat quickly and easily converts into a bed. If you prefer, there is also an additional bed in the elevating roof. 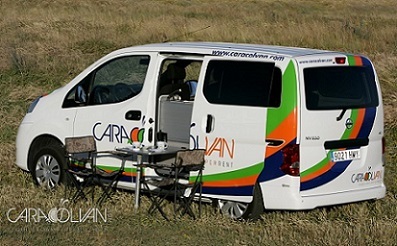 Caracolvan gives you a different way to enjoy your holidays in Spain, offering you an attractive variety of hire vans with special charm and unique characteristics. 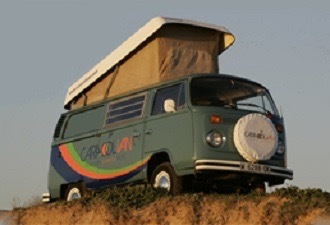 Classic VW Campervans - The legendary Volkswagen vans are a benchmark in the world of leisure. 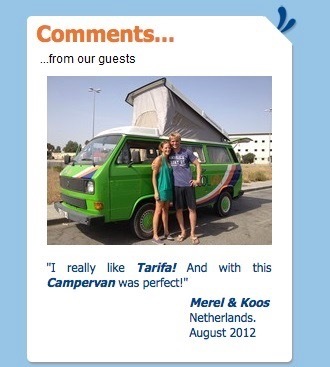 We offer you all the charm in hiring a Vw Campervan in a place as fascinating as Cadiz in southern Andalucia, Spain. Situated 120 km away from Seville, 20 km from Cadiz and 110 km from Tarifa, the mecca of Kite and Wind Surfing in Spain and Europe and surronded by wonderful beaches and great leisure offers - El Puerto de Santa María could be a perfect start for your holidays in Cadiz, Andalucia or Spain. 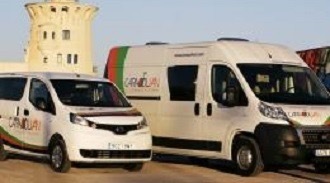 We could bring your Campervan to Seville Airport (SVQ) at your request, with a charge €50 per way. In case you need to arrange any other pick up/return location just let us know in advance and we will arrange everything for a small additional fee. The Campers are essentially compact motorhomes, small vans equipped with everything you need to sleep, eat and carry around what you need for a holiday. Nowadays they are booming because they bring together transportation, hotel and even a restaurant in a few square meters, greatly reducing costs and above all giving unmatched freedom of movement when it comes to enjoying a holiday. "Here today, there tomorrow." The problem is that not everyone can afford to have a second vehicle to use at certain times of the year with all the related costs, insurance, parking, maintenance ... therefore the ideal solution is to resort to renting a camper during your vacation or weekend getaways. 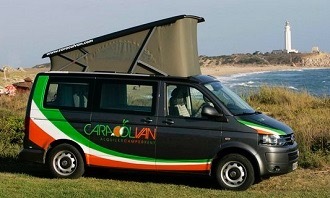 Caracolvan, a special option - For that reason we have made available to all lovers of the Camper vans, and those who are not still fond of them will be, after a holiday in one of them, the possibility of renting a camper van in an environment as wonderful as it is in the province of Cadiz, Andalusia. We have chosen two models of vans for hiring, Caracolvan Classic Camper and Caracolvan Long Distance Camper. For our Classic Camper hire vans we have not chosen any simple one, we wanted it to be the spirit of Campers, the quintessential camping van, in charge of making you spend an unforgettable holiday with it becoming "your van" for a few days. Indeed we are referring to Volkswagen, the first thing that comes to mind when we think of fun at the beach for a few days. We have chosen it for several reasons, for what the California model represents in itself, an icon in the world of camping and vans, but also for their quality standards that allows it, even after 30 years of being made, to be completely up to date in terms of interior amenities or satisfying the needs of a holiday inside it. Bodied by Westphalia and perfectly maintained and overhauled by us, in our rental Classic Camper vans you will find exactly what you would expect if you already know the Vw Campers, and if you do not know you will discover an amazing world of possibilities, carrying in just over 10 square meters, all you need for a memorable holidays in total freedom and full contact with nature. 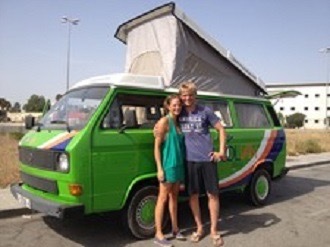 Caracolvan Long Way Camper - After two years of experience with the Classic Vw Camper Vans we have found a way to meet the needs of our customers by offering other types of Camper. Because of this, we also have this for your disposal - the Caracolvan Long Way Mini Camper and Caracolvan Long Distance Maxi Camper. Pictured here is the Nissan NV200/Evalia Caracolvan camper and it is the compact version of all that is needed in an equipped van for traveling and sleeping. What are the requirements to hire with Caracolvan? : You need to be over 25 years old with a driving experience of at least two years, your driving license, your passport and a valid credit card where we can take a deposit (ASK FOR DETAILS) Please note that without this deposit you won´t be able to rent a camper. We are always happy to hear from our fellow dubbers. The easiest way to rent a Caracolvan Camper is to visit their website and click on “booking online”, choose the dates and send them your booking. They will contact you as soon as possible. However, if for any reason you can not or simply don´t want to use their online system, drop them an email and they will make the reservation for you. The daily fare includes your Caracolvan Campervan hire ready to use, basic insurance, and all the basic equipment that a camper normally provides for two people: bed sheets, blankets, pillows, towels, kitchenware and the first gas/petrol load. If there are 4 people and you wish any extra equipment you can book it via the “extras” link on their website page. 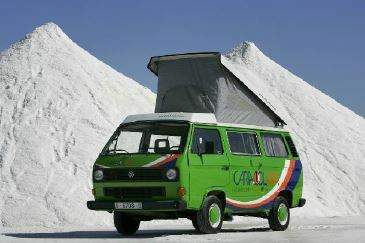 Caracolvan rental vans are exhaustively serviced and maintained, but nevertheless if you suffer a breakdown, they have 24 hour Roadside Assistance. You should contact them and they will send their assistance to wherever you are and try to fix the problem right there. Otherwise they will do their best to fix the van as soon as possible or replace it with another campervan with similar characteristics if it is difficult to repair yours.